you maximizing its storage space. use of packing space inside your suitcase or bag and still keeps your accessories neat. check if everything is there, preventing you from leaving things behind. Large quantity of cables? Lots of small PC accessories? Take so much time to deal with them when you are on holiday? Not a problem anymore to use this electronics accessories organizer. Of course you can also use it to keep your other tools. HIGH QUALITY. Made of heavy-duty, durable and water-resistant nylon, highly protecting your items from scratches, dust and accidental dropping. LARGE CAPACITY. Dimension: 9.4" x 6.6" x 1.4"(L×W×H). Easily tuck in your purse, backpack, laptop case, briefcase, or suitcase. SIMPLE & EFFICIENT. It makes the most efficient use of packing space inside your suitcase or bag and still keeps your accessories neat. Even filling the organizer up it can close easily. MULTI-FUNCTION. It also can be used for as a travel checklist, a healthcare kit, a grooming kit or a cosmetics bag. With our versatile electronics organizer, no more worrying about mess of your small items, just enjoy your life. Applications: Practical design provides great flexibility for organizing your accessories. 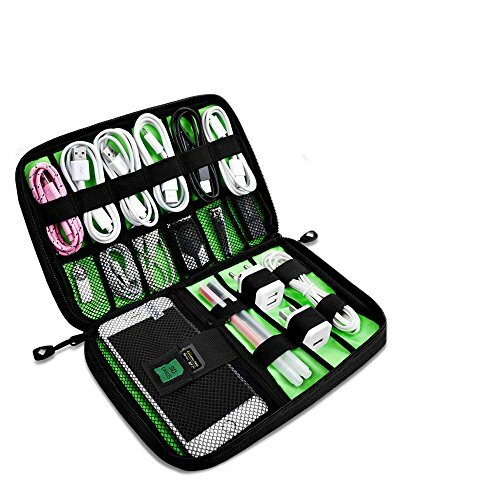 12 elastic loops to hold various small electronic accessories, like USB cables, flash disk, earphone,SD cards, etc. If you have any questions about this product by EUTI, contact us by completing and submitting the form below. If you are looking for a specif part number, please include it with your message.